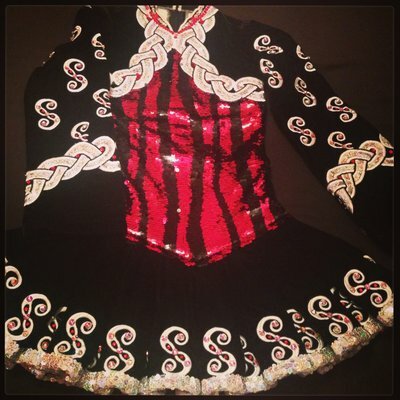 Black and Red sequinned bodice with white and silver celtic plat joining the bodice and neckline. Red and AB diamonds surround neckline. Celtic S on pleated skirt and arm also with diamonds. Silver sequinned rim on the bottom of skirt. Worn by 12-13 tall, slim dancer. Very light to dance in and excellent stage presence. covered in swarovski crystals and kept in immaculate condition inside and out.